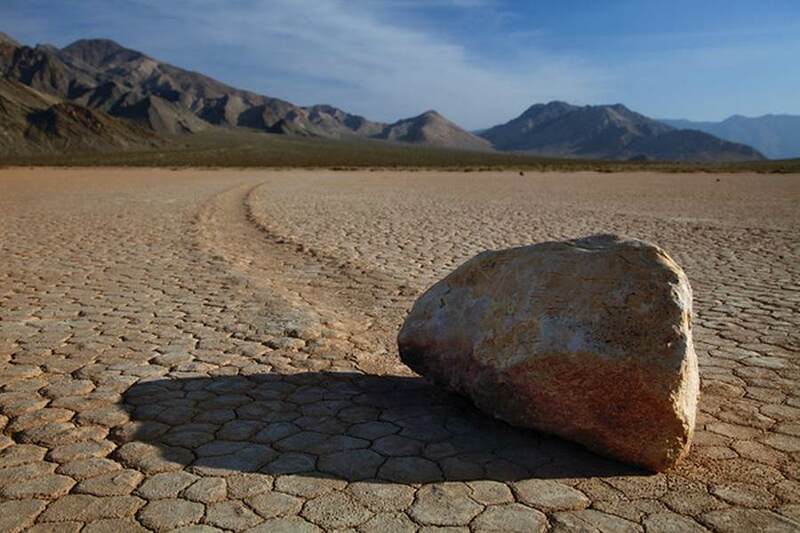 Racetrack Playa is home to an enduring Death Valley mystery. 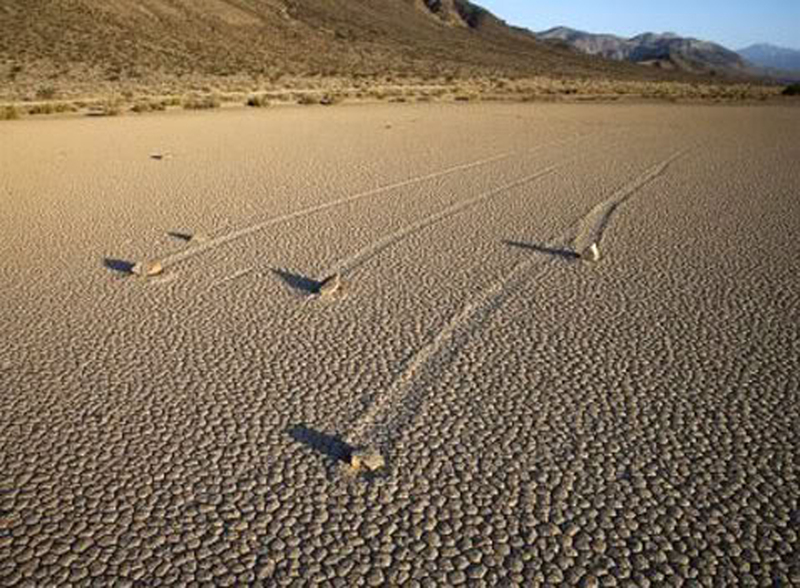 Littered across the surface of this dry lake, also called a “playa,” are hundreds of rocks — some weighing as much as 320 kilograms (700 pounds) — that seem to have been dragged across the ground, leaving synchronized trails that can stretch for hundreds of meters. What powerful force could be moving them? Researchers have investigated this question since the 1940s, but no one has seen the process in action — until now. In a paper published in the journal PLOS ONE on Aug. 27, a team led by Scripps Institution of Oceanography, UC San Diego, paleobiologist Richard Norris reports on first-hand observations of the phenomenon. Because the stones can sit for a decade or more without moving, the researchers did not originally expect to see motion in person. Instead, they decided to monitor the rocks remotely by installing a high-resolution weather station capable of measuring gusts to one-second intervals and fitting 15 rocks with custom-built, motion-activated GPS units. (The National Park Service would not let them use native rocks, so they brought in similar rocks from an outside source.) The experiment was set up in winter 2011 with permission of the Park Service. Then — in what Ralph Lorenz of the Applied Physics Laboratory at the Johns Hopkins University, one of the paper’s authors, suspected would be “the most boring experiment ever” — they waited for something to happen. But in December 2013, Norris and co-author and cousin Jim Norris arrived in Death Valley to discover that the playa was covered with a pond of water seven centimeters (three inches) deep. Shortly after, the rocks began moving. Their observations show that moving the rocks requires a rare combination of events. First, the playa fills with water, which must be deep enough to form floating ice during cold winter nights but shallow enough to expose the rocks. As nighttime temperatures plummet, the pond freezes to form thin sheets of “windowpane” ice, which must be thin enough to move freely but thick enough to maintain strength. On sunny days, the ice begins to melt and break up into large floating panels, which light winds drive across the playa, pushing rocks in front of them and leaving trails in the soft mud below the surface. These observations upended previous theories that had proposed hurricane-force winds, dust devils, slick algal films, or thick sheets of ice as likely contributors to rock motion. 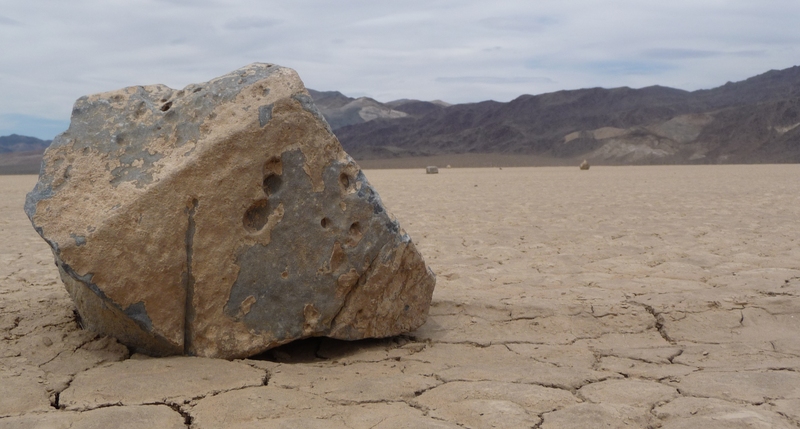 Instead, rocks moved under light winds of about 3-5 meters per second (10 miles per hour) and were driven by ice less than 3-5 millimeters (0.25 inches) thick, a measure too thin to grip large rocks and lift them off the playa, which several papers had proposed as a mechanism to reduce friction. Further, the rocks moved only a few inches per second (2-6 meters per minute), a speed that is almost imperceptible at a distance and without stationary reference points. Individual rocks remained in motion for anywhere from a few seconds to 16 minutes. In one event, the researchers observed rocks three football fields apart began moving simultaneously and traveled over 60 meters (200 feet) before stopping. Rocks often moved multiple times before reaching their final resting place. The researchers also observed rock-less trails formed by grounding ice panels — features that the Park Service had previously suspected were the result of tourists stealing rocks. Richard and Jim Norris, and co-author Jib Ray of Interwoof, started studying the Racetrack’s moving rocks to solve the “public mystery” and set up the “Slithering Stones Research Initiative” to engage a wide circle of friends in the effort. They needed the help of volunteers who repeatedly visited the remote dry lake, quarried the rocks that were fitted with GPS, and maintained custom-made instruments. Lorenz and Brian Jackson of the Department of Physics at Boise State University started working on the phenomenon for their own reasons: They wanted to study dust devils and other desert weather features that might have analogs to processes happening on other planets. “What is striking about prior research on the Racetrack is that almost everybody was doing the work not to gain fame or fortune, but because it is such a neat problem,” said Jim Norris. So is the mystery of the sliding rocks finally solved? 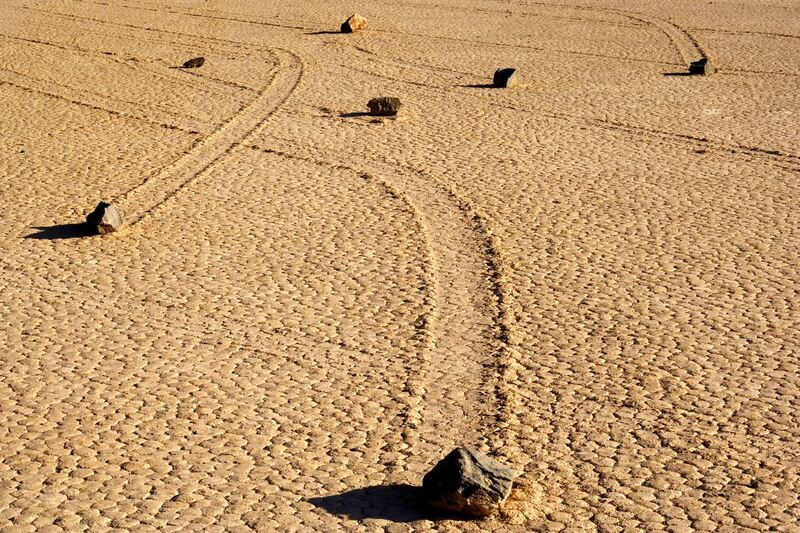 This entry was posted in insolite and tagged étrange, bonheur, death valley, desert, image, internet radio, music, mystère, mystery, photo, picture, radio, rock, sailing stones, streaming, usa, webradio. Bookmark the permalink.